You may have noticed I link to recipes from a certain site an inordinate amount. Truth be told, I really like Annie's Eats. Yes, of course I'm also a Pioneer Woman fan, but Annie's Eats is amazing. Delicious stuff (with beautiful pictures) that I actually want to make -- pretty much every time. So because I had no time this week to cook a decent dinner (we were out of town or at evening meetings every day this week), I'm going to post yet another Annie's Eats recipe that I intend to try when I have a moment of spare time again (tonight?). Melt the butter in a Dutch oven or large stockpot over medium-high heat. Add in the sliced red onions, reduce the heat to medium, and cook, stirring frequently, until the onions have wilted. Mix in the sugar and leeks and continue to cook, stirring frequently, until the onions are completely caramelized and dark in color (about 15 more minutes). Add the garlic to the pot and sauté just until fragrant, about 1 minute. Stir in the chicken and beef broths and red wine, scraping the browned bits from the bottom of the pot. Add the parsley, thyme and bay leaf. Cover, reduce the heat to medium-low and simmer about 30 minutes. Discard the herbs and season with salt and pepper to taste. Preheat the broiler with an oven rack in the upper-middle position. Portion the soup into oven-safe bowls or crocks placed on a baking sheet. Top each serving with two baguette slices, and layer with thin slices of Gruyere cheese. Place under the broiler until the cheese is browned and bubbly, 2-5 minutes. Cool a few minutes before serving. 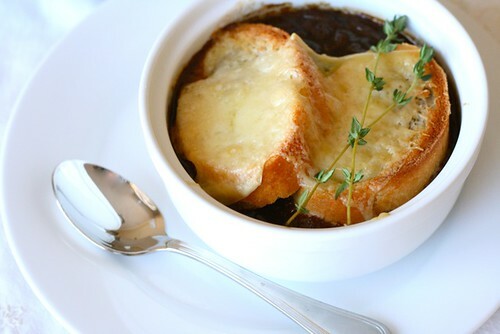 Ooh, that French Onion Soup recipe looks better than mine. And I like mine. I'm offering a recipe for pork chops with mushroom cream sauce today.